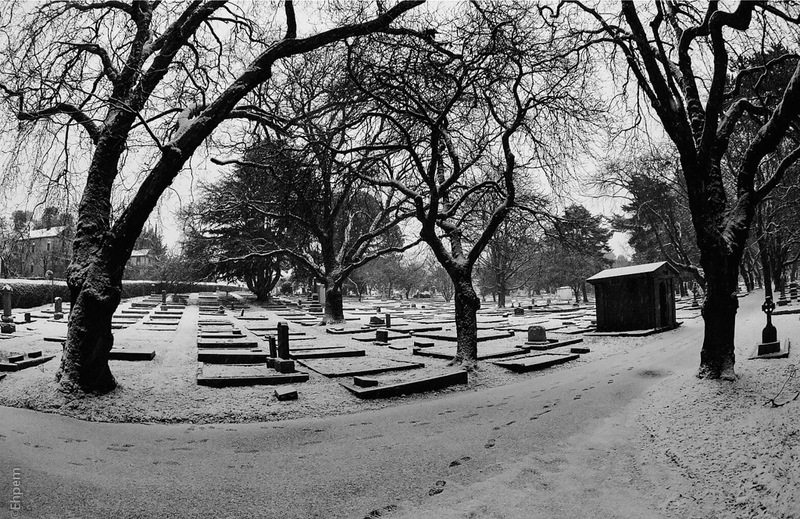 Ross Bay cemetery in the snow in February with fish-eye lens. Canon Elan 7N, Takumar Fish-eye 17/4, Ilford XP2, orange filter? And like Rachel said, the footprints are enchanting. I am glad you like the footprints. I was regretting having made them while taking a picture of the mausoleum, but in the end they work OK. The fish-eye seems well suited to this, I guess it’s the rows of rectangles. Nice! Thanks Lynn, I think the curvy trees make the distortion less obvious, though the path in the foreground is a straight line, but that doesn’t matter. The straight lines receding from the viewer also work because it is near the centre of the image and thus less subject to distortion. There is a lot to learn in using these lenses. Sounds like you’re right on all those counts – I’ve never used one and I see what you mean. A good challenge. This is the first fisheye I have used, and I think this was the first roll as well. I do have a very wide (16mm) lens, but it is not a fisheye and the distortion is very different – it stretches the corners but has little curvature otherwise. In some ways it is less pleasing than this in-your-face distortion because it makes subtly wrong images that can be distracting. Thanks Rachel. This is my kind of selfie. Those are my footprints. I hope that Australia is treating you well. I’d like to go sometime, visit my mum’s sister who just turned 90, and her husband. Doesn’t seem likely I will be able to though.